A slackline is really an interesting idea. Very popular amongst the climbing community, and more or less unknown to everyone else. The concept is quite simple in theory – picture a circus with a tightrope walker high above the spectators, hands out to the sides, balancing her way across the rope to the other side. Now, take out the “tight” part and picture the same person walking across a piece of webbing about an inch wide, as the webbing sags low underneath their weight and wobbles from side to side. Welcome to the curious world of slacklining. Invented by a group of climbers in Yosemite in the 1970’s who found themselves in need of something relatively constructive to occupy their time on rest days, a slackline requires minimal setup using gear that most climbers have on hand anyway. Usually attached to cars, trees, boulders, or any combination thereof, a slackline (usually only 3-5 feet in height) can provide hours of entertainment, while also strengthening the feet and ankles, utilizing core strength, as well as improving balance, coordination, and focus. Probably the most important aspect of slacklining is not any of the physical components (most people reading this already possess enough physical ability to learn it) – but rather the mental components, specifically FOCUS. Its much easier to remain balanced if you have a focal point that remains constant. This is true not only for slackliners, but also for dancers, divers, gymnasts, and the like. Before we moved to Charlotte we had a line in our backyard, and whenever I hopped on it, my eyes immediately gravitate towards a section of the tree where the bark is missing. The biggest temptation is to look at your feet the moment the line starts wobbling (which is pretty much the moment you step on it). 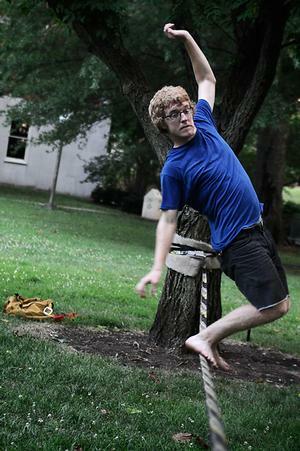 But on a slackline, your feet are a moving target that is hard to focus on. If I want to keep moving and not fall off of the slackline, I have to have a focal point. I can’t be distracted by everything around me, or else I’ll fall off. I think that’s kind of how life is sometimes. If you were to sit down and really think about it, we all have certain priorities that we believe to be the focal point, the real backbone of our lives. These focal points could revolve around faith, people, goals for the future, ideas or “mantras,” etc. But lots of times, the other small stuff that is not important tends to slip in between the cracks – all of a sudden we’re looking at a moving target, and we lose focus. Its when our concentration starts drifting from our main goals and priorities that life starts to get out of balance and out of sync – and if we’re not careful, it can fall apart! For me personally, as long as my focus stays on God and on trying to follow the path He has laid out for me, my life stays balanced. It doesn’t mean that life is easy – just like the slackline wobbles back and forth causing me to bend and move in different ways to adjust to it, life sometimes throws wrenches in my plans and forces me to change directions or do things differently. But so long as my focal point is in the right spot, I very rarely fall down, no matter how much the line wobbles – and if I do, I just get right back on the line again. What do you focus on to keep life in balance? Finding balance on a slackline & in life: http://t.co/DcnPjHRL Thanks @cragmama for a great read! Excellent post!! I can’t agree with you more. That is a perfect example and I’ll be thinking of that everytime I’m on it.